Elizabeth Ann Riggs was one of seven children and grew up in Camden, NJ. Known as Liz, by friends and family, she married and had 2 sons then completed Law School at Rutgers University. Upon her graduation from Rutgers University in 1973, Judge Riggs first moved to Bakersfield, CA where she worked for the California Rural Legal Aid Society. She moved to San Diego in 1974 as a Deputy District Attorney and had a third son. She worked as a State Deputy Attorney General until Governor Jerry Brown appointed her Municipal Court Judge in 1979. She became the first black female judge in San Diego County and remained the sole black woman on the San Diego County bench for nearly 22 years. 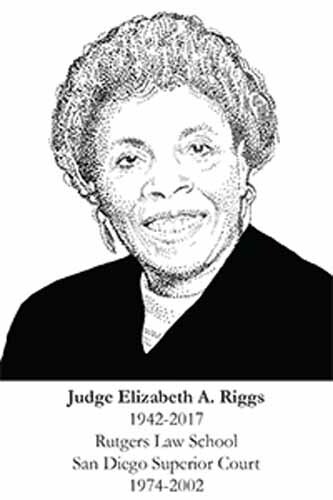 Judge Riggs was a lifelong Democrat pioneer throughout her career, and a strong supporter for civil rights, women’s rights, and a community activist. She was a co-founder of the Association of Black Attorneys, alongside one of her mentors the late US District Federal Court Judge Napoleon Jones. The Association was later renamed the Earl B. Gilliam Bar Association, after another one of her mentors, the late Judge Earl B. Gilliam, a noteworthy pioneer in the San Diego legal community, and the first Black US District Federal Court Judge responsible for the San Diego area. Judge Riggs served as a Board member on a number of community non-profits. In 2002, she officially retired from the Bench as a Superior Court Judge. The San Diego City Council officially proclaimed February 2, 2002, “Judge Elizabeth A. Riggs Day”. Although retired, she remained active in the legal community in San Diego, including Substitute Judge Assignments throughout Southern California. Besides the law and public life, she was devoted to family above all, but also to education, reading, theatre, and concert music. Her love of travel literally spanned the Globe. But her passion was the spelling board game, Scrabble. Judge Riggs was named to the San Diego Women’s Hall of Fame as a Trailblazer in 2008. Judge Riggs died in 2017, survived by 3 sons and 3 grandchildren as well as 4 siblings. She leaves a legacy as a trailblazer and activist who served the law with honor and distinction.